Donald Trump took about a dozen questions from supporters at his New Hampshire town hall event Thursday. But the first half of the event was more of a speech, where he started by highlighting the latest polls that show him leading Hillary Clinton. Trump held the uncharacteristic town hall forum three days before he goes head-to-head with Hillary Clinton at the second presidential debate, which will take a similar format. But don't suggest to Trump that this was in any way a warm-up act. 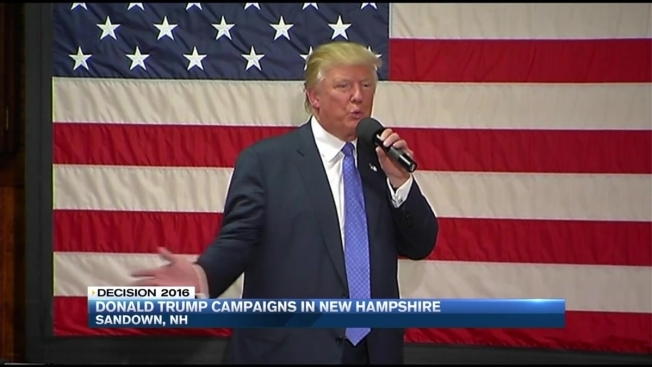 "Even today, they said 'Donald Trump is going to New Hampshire to practice for Sunday.' This has nothing to do with Sunday. And it's like they make you into, like, a child," Trump said. "I love the people of New Hampshire. This was set up a little while ago, they were going to cancel it, and I said 'why are you going to cancel it?' 'Well, you want to debate prep.' I said 'Forget debate prep.' I mean, give me a break. Do you really think that Hillary Clinton is debate prepping for three or four days? Hillary Clinton is resting. OK? She's resting. She wants to build up her energy for Sunday night. And you know what? That's fine. But the narrative is so foolish. I'm here for one reason. I love the people of New Hampshire." Trump was asked by his supporters to name Obama's foreign-policy failures, what he would say to Hispanics deceived by Obama and if he planned to be tougher on Clinton in the next debate. "I did hold back," Trump said of the first debate. "I thought it was just inappropriate to say what I was really thinking I would say and I held back ... I'd much rather have it be on policy, and I didn't like getting into the into the gutter." Trump's fired campaign manager Corey Lewandowski, a New Hampshire native, was at the event, as was trusted adviser and New Jersey Gov. Chris Christie, said to be a key figure in helping Trump to master the "art of the town hall."